Chromium Picolinate: Don’t use it if you want to get fat! Chromium picolinate consists of the element chromium bound to picolinic acid (a substance found in the body). Chromium is an essential trace mineral involved in glucose metabolism and in the regulation of insulin, cholesterol and other lipids. In the body chromium facilitates the interaction of insulin with its receptor. By some estimates, dietary chromium intake in the developed countries is only half of the generally accepted minimum (50 micrograms per day). Chromium deficiency is associated with diabetes and cardiovascular diseases. treatment and prevention of diabetes and alcoholism. In clinical studies, chromium picolinate also appeared to reduce bone loss after menopause, and at 600 mg/day for 8 weeks significantly ameliorated the most common form of depression. Chromium picolinate consists of the element chromium bound to picolinic acid (a substance found in the body). The picolinate form of chromium is believed to be considerably more bioavailable than other chromium compounds. Chromium is an essential trace mineral involved in glucose metabolism and in the regulation of insulin, cholesterol and other lipids. In the body chromium is transformed into its biologically active form, known as glucose tolerance factor, in which it is complexed with nicotinic acid. This complex facilitates the interaction of insulin with its receptor. By some estimates, dietary chromium intake in the developed countries is only half of the generally accepted minimum (50 micrograms). Chromium deficiency is associated with diabetes and cardiovascular diseases. 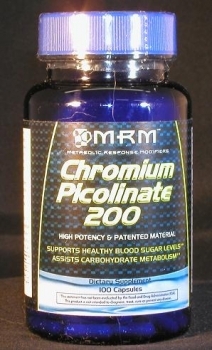 Chromium picolinate supplements have been widely promoted as agents for producing metabolic rate increases, appetite control, reduced body fat, lowered serum cholesterol, blood sugar regulation, increased energy and stamina, larger muscles, and for treatment and prevention of diabetes and alcoholism. The claims made for these uses are mostly extrapolations from biochemical experiments and animal studies, and may turn out to be exaggerated. Nevertheless, animal studies and some human studies do show that high doses of chromium can increase lean body mass, decrease fat mass, decrease growth of tumors, improve insulin activity, and increase life span. In clinical studies, chromium picolinate appeared to reduce bone loss after menopause, and at 600 mg/day for 8 weeks significantly ameliorated the most common form of depression.